Who would have thought that Allan Holdsworth would be making a new record with John Marshall. The guys have not played together since 1974. 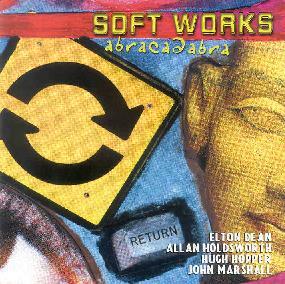 Bring in past Soft Machine players Elton Dean and Hugh Hopper and you are in for some serious music. The picture in the liner notes shows four guys with gray hair and a lot of musical experience. This CD was recorded in two days at Eastcote Studios in London in June 2002. The music is much more laid back jazz style and not rock at all. "Seven Formerly" opens the CD and Holdsworth starts with the synth axe while Dean plays some beautiful sax. The track slowly builds and Allan lets it rip. "First Trane" again lets Elton Dean take the lead and Allan, layer in the sound effects with the synthaxe before taking to the guitar. "Willie's Knee" is sort of lite funk. The title track is probably my favorite. These guys can still play and play well. While I recently picked up the Soft Machine Peel Sessions double CD and this is highly recommended, I found this to be a most pleasant and listenable musical experience.